Sat and talked with my downstairs neighbour D this morning. He is studying at Wollongong TAFE and lived five years in Surry Hills before coming to The Bates Motel. He came to Australia via Uganda, but is originally from Southern Sudan. Figures from this time last year say that Uganda hosts about 100,000 refugees from Rwanda, Ethopia, Somalia, Eritrea, Kenya and Sudan. They live in various refugee camps scattered all over the country. Makes you think, doesn’t it? Why on earth are we getting so uptight about 5-6000 “boat arrivals”? D likes Wollongong better than Sydney; it’s more laid back and the people are more friendly. Here I am with the new multifocal glasses which I picked up from Teachers’ Eye Care in Sydney on Friday. You also can see how The Bates Motel has come up lately. I also went by Elizabeth Street and saw the progress M has been making on the renovations there. I have updated Howard on Q&A — 1 adding some material. I will deal with immigration at a later time. Blame Marcellous! I was fascinated by the sites he linked to in his comment yesterday, so John Howard can wait. 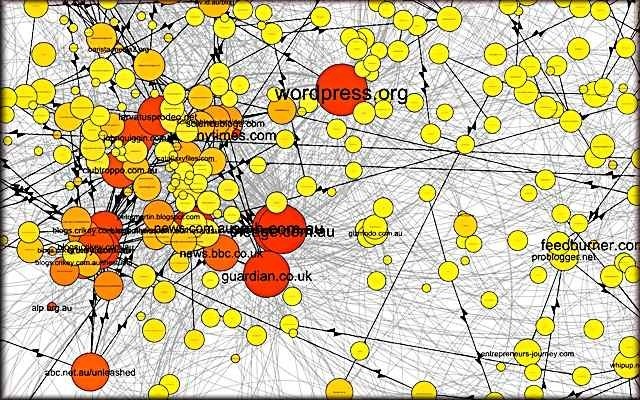 what we’re already seeing in the network is a relatively large cluster of sites on the left of the graph, made up of sites (MSM as well as blogs) that deal predominantly with news and politics. 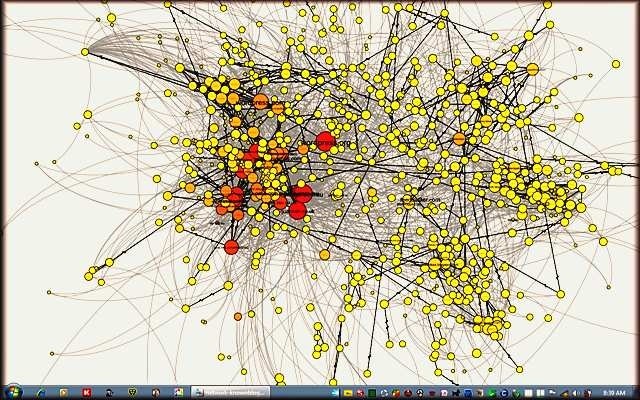 In addition to domestic and international news sites, various Australian political blogs (such as Larvatus Prodeo, Club Troppo, John Quiggin, Peter Martin, Catallaxy Files, and the suite of Crikeyblogs) appear as prominent nodes in the network (on both the indegree and eigenvector centrality counts). 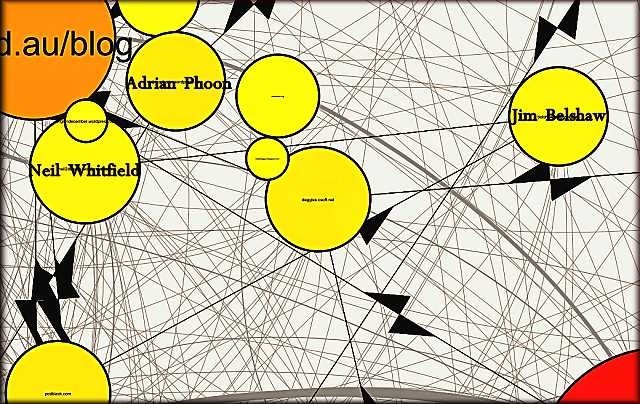 Many smaller – that is, less prominent – blogs cluster around them, but receive comparatively fewer inlinks. There’s even likely to be some further subdivision within this overall cluster, but I wouldn’t want to speculate too much on this point until we’ve had a chance to further clean our data. Don’t ask me what “indegree and eigenvector centrality counts” are! 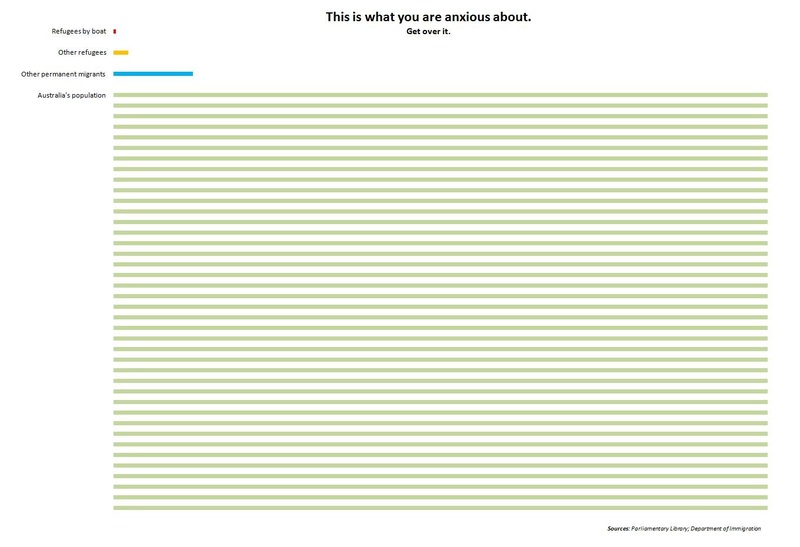 But these captures from the PDF file of the chart are fascinating. Jim Belshaw and Adrian Phoon, please note. Wettish at The Bates Motel this afternoon. First I should say this was an excellent episode of Q&A and second that John Howard did handle the situation very well. That said, as I noted yesterday, he was somewhat less than straight in some of his responses. Peter Costello argues trenchantly that this is so in his Sydney Morning Herald piece today. …A true leader can rejoice in the success of those around him. He does not need to demean their achievements and blame them for his own miscalculation. And all these tricky gymnastics about whether he was or wasn’t going to go. When is a promise not a promise? When is a deal not a deal? It was all just a distraction from what I belatedly realised: John Howard was never going to stand aside for anyone. He never had and he never would. This might have been the right thing, according to his family. But that was not the point. The point was whether he did the right thing by those MPs who would go on to lose their seats in the 2007 election. Some of them have never had a job since. And more, the point is whether he did the best thing for the Liberal Party and the best thing for the country? If you happen to believe, as I do, that we have had a bad government for the last three years, you realise how important it was for the Coalition, in 2007, to do everything it could to renew itself and extend its term in government. The failure to do so was not in the interest of the nation or its people. I cannot take the credit for that. The principal credit for that failure must go to the person who was responsible. It belongs squarely to John Howard. Unfortunately there were other examples of tricky gymnastics last night. The essence of Stone’s complaint was that the government was seen as ”mean and tricky”. The charge was principally directed at me. But as the years wore on the description was more frequently levelled at Howard. On the night of the 1998 election, having survived by a whisker, Howard said he would commit himself ”very genuinely to the case of true reconciliation”. When there was a genuine spirit of goodwill about Aboriginal reconciliation in 2000 it would not have hurt to embrace it and walk across the Sydney Harbour Bridge. It didn’t mean you agreed with every demand every person walking that day wanted to make. It would have shown a generosity of spirit. JOHN HOWARD: Well, I don’t know that I cut my teeth in politics at the time. When I entered parliament in 1974 it had – seven years had passed since a Liberal Prime Minister, Harold Holt – I repeat a Liberal Prime Minister Harold Holt – had abolished the White Australia Policy. I don’t think – I mean, look, I am a creature of my generation and my age. I grew up when the White Australia Policy operated. I thought it was wrong and I was glad when it disappeared and I think this country is better as a consequence but, look, I mean people can throw these slogans around and they can say something is racist. I mean, I don’t think my government’s policies were in any way racist. If you talk about Indigenous policies, well, the most dramatic thing we did in Indigenous policy was the Northern Territory intervention in 2007, which overturned 30 years of failed policy of separate development and I think that intervention was in the name of protecting children and giving them the most basic of all rights, and that is a right to childlike innocence and a right to protection against abuse. I didn’t think that was racist. I thought it was humane. TONY JONES: Our next question is also on Indigenous policy or at least an aspect of it, and it comes from John Harding-Easson. JOHN HARDING-EASSON: Mr Howard, you always advocated practical measures such as that with the NT intervention but given the positive response to the apology by your successor, do you now accept that that symbolism, which cost so little to the rest of the Australian community and yet meant so much to Indigenous Australians, was something you should have done? Howard’s failure of imagination on the question of reconciliation appalled me at the time and still does. Leaving aside for the moment whether the Intervention was all Howard claimed, he is rather making the most of it; after all from 1996 to 2007 his government did bugger all, relatively speaking, about Aboriginal issues. Yet I agree with Howard’s objection to the word “racist”, and believe that also holds, on reflection, in the matter of their immigration and refugee policies, much as I disagreed with most of what they did and Gillard continues to do. But that is matter for another post. On David Hicks he slides over the real issue: for more on what the real issue may be see Hicks v Howard by Bruce Haigh and Kellie Tranter. Whether or not you believe David Hicks’ version of his own story is irrelevant. Since 2001 the low brow focus on whether or not ‘Hicks had it coming’ has successfully diverted attention away from fundamental issues of legal and political importance. It’s been so effective, in fact, that it enabled Howard, Downer and Ruddock to disregard the ideas behind habeas corpus (an ancient common law prerogative writ), rules of law and of due process, and four Geneva Conventions. The end result – an unprecedented abuse of public office to the detriment of an Australian citizen – is unforgiveable. Such acts of political bastardry will never be seen as the acts of principled leaders, and certainly not of statesmen. On the Iraq War Howard avoided really dealing with the question; the shoe-thrower shot himself in the foot (um!) by not letting his question do the work and actually helping John Howard out. PETE GRAY: Thanks, Tony. The recent releases of American military information from Wikileaks show evidence of tens of thousands of civilian casualties as a result of the invasion of Iraq, as well as widespread abuse and torture of prisoners. There were no weapons of mass destruction found. Many people now regard the Iraq war as a strategic failure and think it probably incited more terrorist violence than it stopped. How should you be held accountable for Iraq’s participation – for Australia’s participation in the war of Iraq – war on Iraq? You just said a moment ago that you defend our participation and you leading our country into a war that most Australian’s oppose. How do you defend it? JOHN HOWARD: Well, I accept responsibility. PETE GRAY: You accept responsibility? JOHN HOWARD: I accept responsibility. JOHN HOWARD: No, well, hang on. PETE GRAY: …and accept responsibility. JOHN HOWARD: Well, hang on. TONY JONES: All right. All right. TONY JONES: Okay. You’re watching – sorry about that. We’ve got to move on. We’re watching Q&A with the – that’s Q&A special with the former Prime Minister, John Howard. PETE GRAY: (Indistinct) Sorry, Tony, take it as a comment. TONY JONES: No. No. No. We’re not going to do that. PETE GRAY: That’s for the Iraqi (indistinct) and this is for the Iraqi (indistinct). Tony Jones raised an interesting point which I don’t think Howard handled all that well. TONY JONES: Mr Howard, one of the interesting things that I read and I do actually have the drop on some of these people, as you say, because I have read the book or most of it. One of the interesting things is the first you hear of action against Iraq – that action against Iraq was likely to be back on the US agenda as a result – was as a result of the September 11 attacks. Now, this is told to you by the Australian ambassador to the US, Michael Thawley, in discussions you had with him immediately after the September 11 attacks on September 11 and September 12. Now, first of all, why did he think the Americans would jump to attacks on Iraq as a result of September 11? Finally, it appears that John Howard is now a climate change agnostic rather than a climate change sceptic. I have decided to postpone the second part on immigration policy, but to support Howard, for once, in his claim that his government’s immigration policy was hardly racist I would draw attention to just one example of an increasingly visible result of that policy. I took that in Alexandria (South Sydney) three months ago. Black African Muslim youth were very thin on the ground in Sydney pre-Howard; not so now. JOHN HOWARD: Look, I’m not running away from what I proposed in government…. People are sometimes a bit dubious about the level of medical care in The Gong; Dr C for example told me if ever I was sick to hightail it back to Sydney. Well there was no doing that today when my right leg seized up as I was walking from The Bates Motel to Wollongong Library; it had also happened on Sunday when I did a Mount Keira Road walk. Painful. I hobbled on to the local bulk-billing Medical Centre: crowded, but not too bad. The doc I saw thought it was probably muscular, as did I, but he wasn’t 100% sure (given my age) that it was not deep vein thrombosis, so at 4 pm I bussed to a vascular specialist and had an ultrasound. The ultrasound woman congratulated me on my fine leg muscles – the only muscles apart perhaps from the jaw that might deserve such a compliment. Fortunately I don’t have a thrombosis, so consequently I am still hobbling a bit but am not in hospital. A very Wollongong touch back at the Medical Centre was that while waiting for the people to book the ultrasound (an “emergency” – hence the same day service) a teenage boy with razor scooter sitting beside me started to tell me jokes. Nice lad. Can’t remember things like that so much in Surry Hills. Oh and last night’s Q&A? Tomorrow. The sun set over The Bates Motel an hour ago. About 1/4 of the way up the mountain.